The par-five third at Baltray with the Boyne estuary in the background. 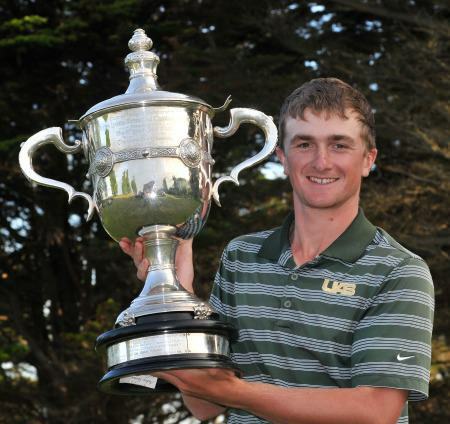 1945 Greystones’ Paul Dunne produced a best of the afternoon 69 to trail leader Dessie Morgan by a stroke in the opening round of the East of Ireland Amateur Open at Baltray. 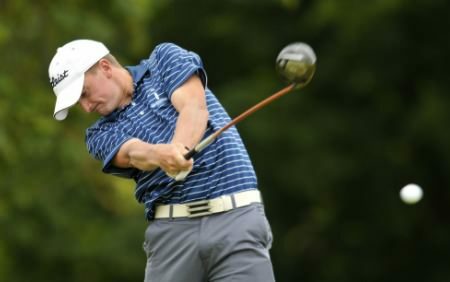 Heading into his junior year at the University of Alabama Birmingham in August, the 20 year old birdied the eighth from 35 feet but bogeyed the 11th before finishing strongly in showery afternoon conditions. 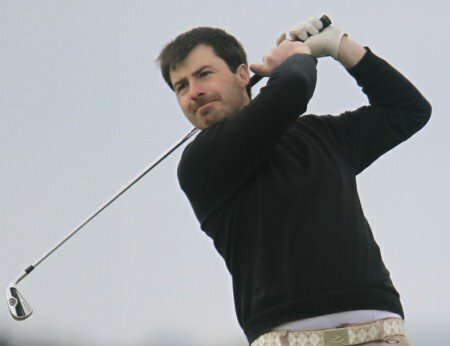 Mullingar’s Dessie Morgan continues to lead the first round of the East of Ireland Amateur following a four under 68 in the best of the morning conditions (see below). The 32-year old had six birdies and two bogeys to lead by two shots from The Island’s Paul McBride in light to moderate breezes. With the wind rising around midday, Portmarnock’s Geoff Lenehan and Rathmore’s Ben Best survived some heavy afternoon showers to card 71s and join debutant Kealan Quigg from City of Derry, Tullamore’s Stuart Grehan, Portmarnock’s Stephen Walsh and Massereene’s Tiarnan McLarnon just three shots off the pace in join third. As defending champion Chris Selfridge struggled to seven over par through 12 holes, Limerick’s Pat Murray raced to four under through eight but tangled too many times with the heavy rough and followed bogeys at the ninth, 12th and 13th with a double bogey six at the 16th to post a one over 73. Dessie Morgan, picture here during last year’s final round, opened with a 68 to take the early lead in the East of Ireland Championship at Co Louth. 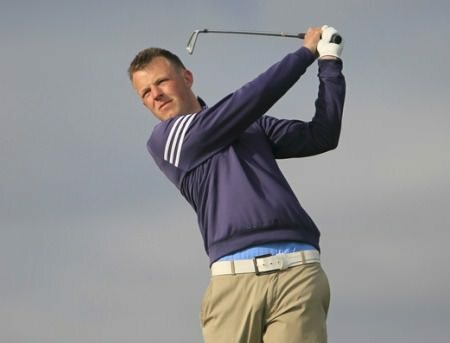 Photo Jenny Matthews/www.golffile.ie1554 Mullingar’s Dessie Morgan took advantage of the best of the early morning weather to fire a four under 68 and take a two-shot clubhouse lead in the opening round of the East of Ireland Amateur Open at Baltray. 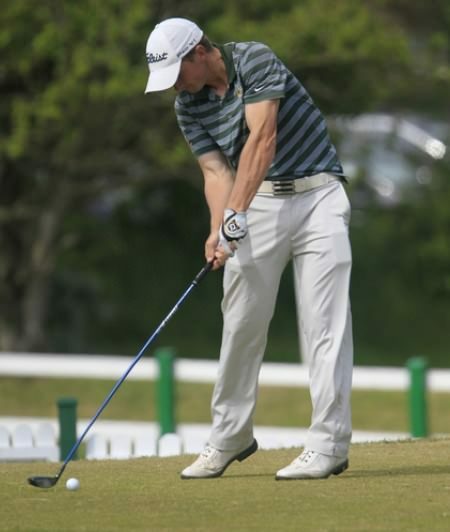 The 32-year old former Leinster interprovincial had six birdies and two bogeys on his card, picking up shots at all the par-fives to head the field from The Island’s Paul McBride, who carded a fine 70. City of Derry’s Kealan, who is making his ‘East’ debut, Tullamore’s Stuart Grehan, Portmarnock’s Stephen Walsh and Massereene’s Tiarnan McLarnon were three adrift after 71s. “We got the best of it,” Morgan said. 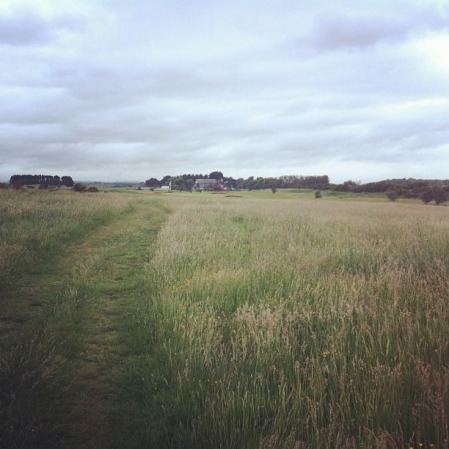 “The wind really picked up when we were on our 14th or 15th hole. If I had had to play the fifth then, I would have been hitting a four or a five iron rather than a seven. With the rough heavier than it’s been in years, Morgan opened with a bogey at the 10th when he missed the fairway left and saw his eight iron fly through the back from where he failed to make good contact from another tangly lie and failed to get up and down. The Island’s Paul McBride during the first round of the East of Ireland Amateur Open Championship 2013 at Co Louth Golf Club, Picture: Thos Caffrey / www.golffile.ieAfter getting up and down from 80 yards for birdie at the 18th, holing an eight footer for his four to get to two under par, he birdied the par-five second and third to get to four under par. He dropped his second shot of the day at the short fifth, where he double crossed his seven-iron tee shot and pulled it before failing with a 10 footer for par. However, a birdie at the sixth, where he hit a drive and a four iron close to the green and chipped dead, got him back to four under. And while he missed an eight footer for birdie at the ninth after a superb nine-iron approach, he was delighted with his score.